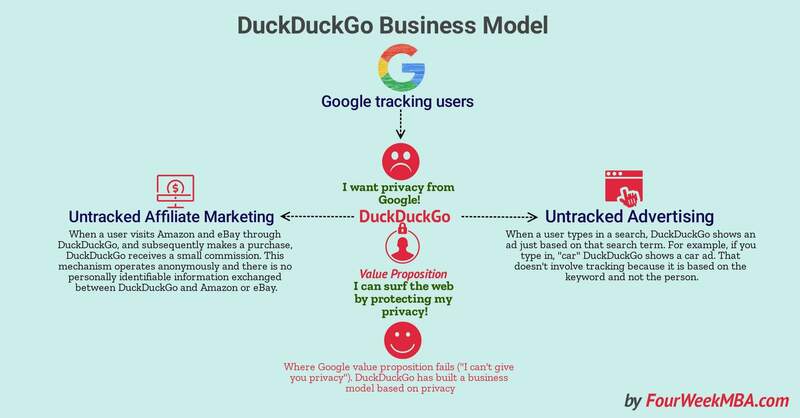 DuckDuckGo‘s business model starts from Google value proposition. Related: How Does Google Make Money? It’s Not Just Advertising! When you surf the web through Google, the search engine is tracking you so that you can get targeted ads by the businesses part of the AdWords network. While this is interesting for businesses, which can quickly make money from advertising. That is a flaw in this model: users’ privacy. In fact, as concerns from how data online gets used by private companies or governments that opens up new concerns from users. A concern is a threat to an established organization, but an opportunity for a rising one. Those fears can become a value proposition. That is precisely what DuckDuckGo has done. Privacy has been the beginning one of the reasons why the search engine got built. According to DuckDuckGo‘s founder, Gabriel Weinberg, that is a myth that you have to track users to advertise. One a person enters a keyword into the search box, and if that keyword could be connected to a product or service, then the search engine may return an ad within the results. For instance, if I’m searching for “car insurance” then the search engine will return an advertisement related to that. As simple as that. The search engine will not track either use your data as it will through it right after the search gets completed. In short, where Google value proposition fails, DuckDuckGo builds up a business. DuckDuckGo‘s business model has one key stakeholder: users. And it has one fundamental value proposition: privacy! There is nothing innovative about affiliate marketing. What is innovative is the use of that for a search engine. As we saw DuckDuckGo uses affiliations as a way to generate revenue streams together with untargeted advertising. As of 2015, DuckDuckGo was profitable, and its revenues exceeded $1 million. Compared to Google‘s 74.9 billion. In short, DuckDuckGo revenues make up about 0.001% of Google‘s revenue. Of course, the fact that the company is profitable and able to grow its users’ base consistently is a good sign. However, will it be able to grow enough to be sustainable in the long run? That will depend on whether or not users’ concerns related to privacy will grow and DuckDuckGo ability to create new revenue generation patterns, besides advertising and affiliate marketing. For instance, if privacy is a substantial concern, a subscription-based web search might be one option. Experimentation here is the key to find its business model-market fit! DuckDuckGo has managed to build a business model based on differentiating its value proposition compared to Google. Google’s value mainly comes from its ability to track its users to offer targeted ads. While this is a strength that makes it attractive for businesses to pay for Google ads, and publishers to know what content users want, that might also be a weakness. As privacy concerns grow, more users are willing to give up Google to find an alternative to that. Based on that. DuckDuckGo has built a value proposition based on privacy. Where Google tracks its users, DuckDuckGo doesn’t. So how does it make money? Mainly through untracked advertising and affiliate marketing. Is this business model sustainable? As of 2015, DuckDuckGo was already profitable. It revenues though are a tiny fraction of Google revenues. Thus, the question that comes to mind is “will ever DuckDuckGo become a dominant player?” That is hard to answer, and it will depend on DuckDuckGo ability to experiment with other sources of revenue generations. For instance, if privacy is something so critical for DuckDuckGo users, why not experimenting with a subscription-based search? Who says that search has to be free at all? it is good that companies like duckduckgo exists to leave our privacy alone. As long as duckduckgo does not get the growth fever, or go public and subject itself to pressure to earn earn earn, it should be sustainable. Companies can be great without becoming big.